One minidress in the Jean-Charles de Castelbajac Autumn/Winter 2007-2008 Show paid homage to Blondie. Another Blondie-inspired collection : A.L.C. Autumn/Winter 2013-2014 (the starting point of this collection, designed by Andrea Lieberman, was a picture of Blondie’s Debbie Harry looking tough in Amos Poe’s « The Foreigner » film). To read about other Blondie or Debbie Harry-inspired collections or items, search for the « Debbie Harry » post that I have published on November 8, 2012. Moulin Rouge has influenced the Jean Paul Gaultier Couture Spring/Summer 2011 Show, « Punk Cancan », whose finale featured a French cancan number, performed by Psykko Tico from the Crazy Horse. Other Moulin Rouge-inspired collections : Charles Anastase Spring/Summer 2009 (the theme of this show was « a schoolgirl rampage through the Moulin Rouge »), Dee Hutton Autumn/Winter 2013-2014 (this collection draws inspiration from the Moulin Rouge). 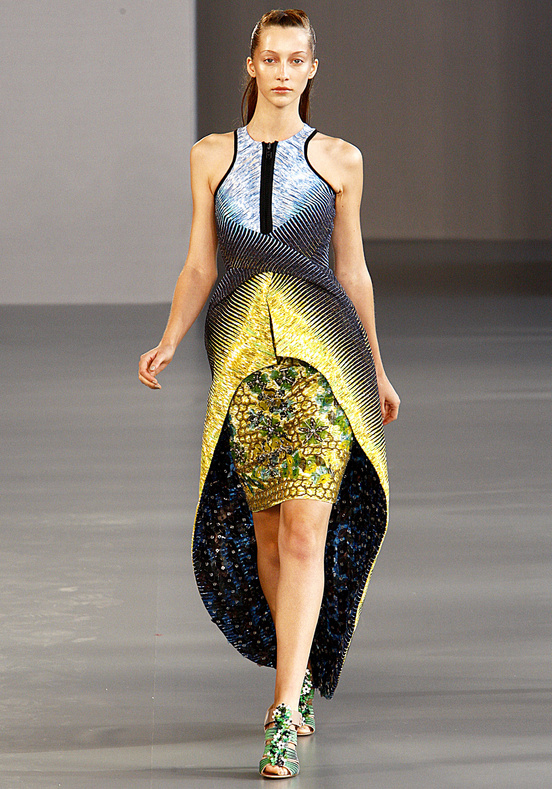 A trek into the jungle of Indonesia influenced the Peter Pilotto Spring/Summer 2012 Show. Other Indonesia-inspired collections : Givenchy by Riccardo Tisci Couture Autumn/Winter 2006-2007 (the references of this collection included Indonesia), Kenzo by Humberto Leon and Carol Lim Spring/Summer 2013 Menswear (one of the starting points of this collection was a trek into the jungle of Indonesia), Louis Vuitton by Kim Jones Spring/Summer 2013 Menswear (Kim Jones’ trip to Indonesia influenced this show), Roberto Cavalli Spring/Summer 2011 Menswear (this show featured Indonesia-inspired prints). Gerrit Rietveld’s work and the intersection of prints and plains have influenced the Yeohlee Pre-Fall 2014 Collection. Alighiero Boetti’s abstract works have influenced the prints of the Jil Sander Spring/Summer 2014 Show. Another Alighiero Boetti-inspired collection : Giambattista Valli Spring/Summer 2014 (Alighiero Boetti was one of the artists from the Arte Povera movement that were referenced in this show). 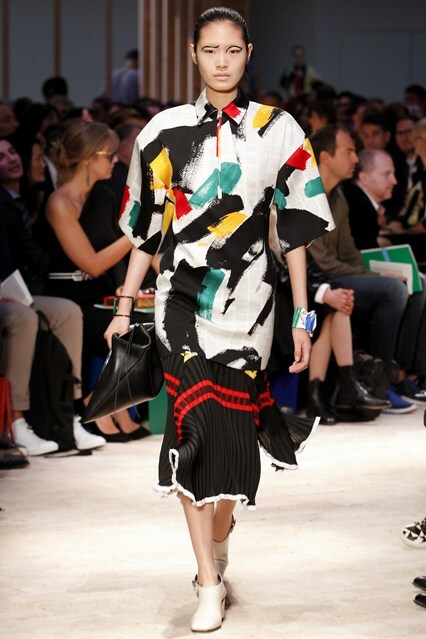 Brassaï’s « Graffiti » photographs have influenced the motifs of the Céline by Phoebe Philo Spring/Summer 2014 Show. Another Brassaï-inspired collection : Marc Jacobs Autumn/Winter 2011-2012 (this show was partly based on Brassaï’s « Paris by Night » book). 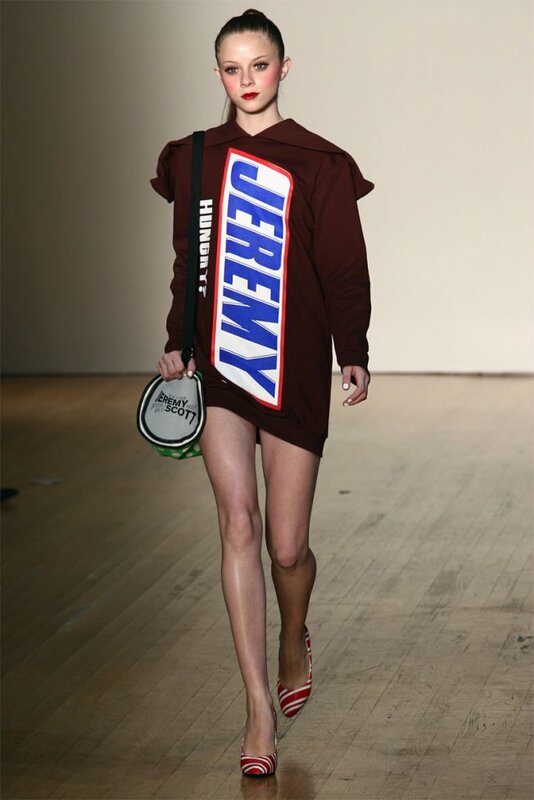 One outfit in the Jeremy Scott Autumn/Winter 2006-2007 Show, named « Eat the Rich », reimagined the Snickers®’ packaging.